I have been searching for a good book about evolution that doesn’t go so deep it gets confusing for my kiddo. 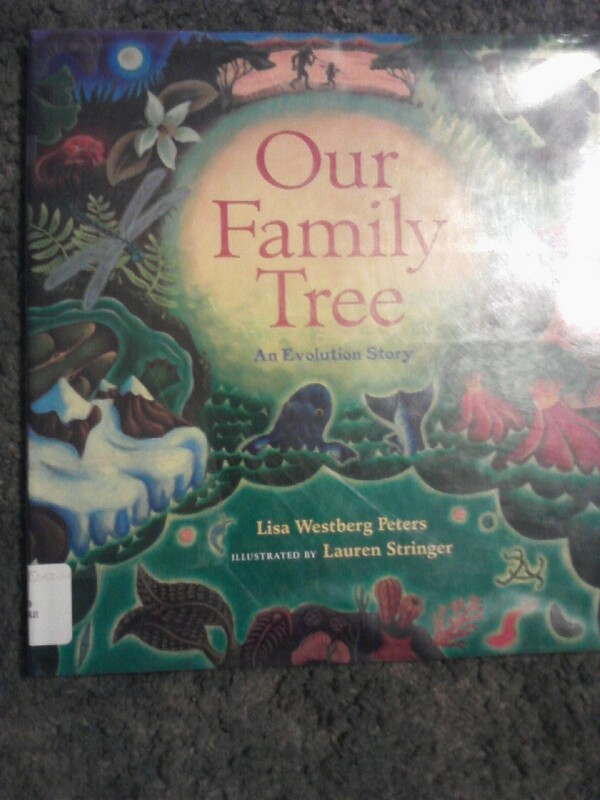 She’s already a big fan of Lucy—we saw a replica of her at the St. Louis Science Center—so I wasn’t too worried, but I still hadn’t been able to find anything I really liked until I came across Lisa Westber Peters’ book Our Family Tree: An Evolution Story. Luckily our library had a copy, and I instantly fell in love with the book. It starts out with a family at the beach, contemplating how much we have changed since life on Earth began. Illustrator Laruen Stringer’s gorgeous artwork depicts tiny microscopic beings filled with genetic code—DNA and other terms are explained at the back of the book if you wish to read them as well, followed by slow, slow changes. The illustrations and lovely prose—slow and scientific, just like the evolutionary process within the story and life itself—continue throughout the whole book this way, and we get to see glowing jellyfish and other beings, volcanoes erupting, and the first creatures with a backbone develop. This is where the author starts adding human body parts, piece by piece, explaining where they came from as they slowly, incredibly, developed into what makes us who we are today. I’m 30 years old and the descriptions and artwork amazed me; I can only imagine how it would amaze young people across the country, particularly in schools where evolution is taught alongside creationism as “one theory.” It’s a lovely gift for the small scientists in your life—and the big ones, too.